Hilma by Carr Lane Roemheld is a worldwide market leader in quick die change systems and products. We offer the most complete range of die clamping and handling systems in the industry for applications with mechanical presses, hydraulic presses, forging presses, injection molding machines and die cast machines. To survive in today’s competitive worldwide market, manufacturers are reducing inventory costs by running smaller batch sizes and making shorter production runs. One way to maximize press uptime in an environment like this is to implement faster more effective die changes. The Hilma Quick Die Change System helps manufacturers accomplish these goals, shortening die change time and making facilities more productive and profitable. Learn more about the full line of Roemheld quick die change products and how they help drastically reduce downtime, increase production runs and more. Hilma adjustable hydraulic clamping elements, are positioned by moving them in T-slots provided on the press/machine and are ideal for retrofitting without the need to standardize die widths. Included in this section are hollow piston cylinders, sliding clamps, clamping systems and pusher chains, adjusting spindles & pneumatic cylinders. Hilma hydraulic clamping elements, are integrated in the press/machine. The design of these clamping systems ensures an optimum utilization of the bed without any colliding edges during die positioning. Hilma electro-mechanical clamping elements provide maximum operational reliability as a result of mechanical self-locking. These clamping systems are recommended for applications where a hydraulic system cannot be used. 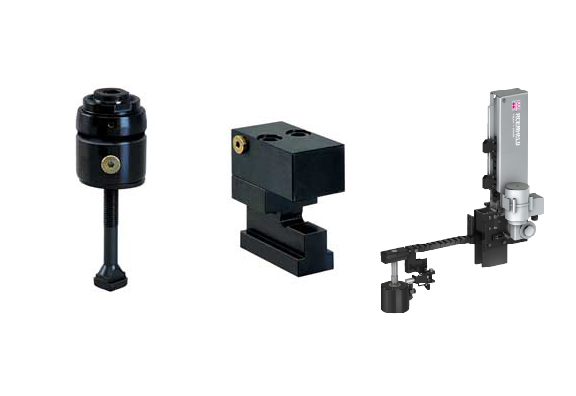 Mechanical clamping elements feature a compact design with high power density. High clamping forces and convenient use are of prime importance for customers who choose these clamping elements. Hilma offers sliding clamps, high-pressure spindles & clamping nuts. Hilma hydraulic or pneumatic-hydraulic power units feature a compact design ready for connection. Hydraulic or pneumatic power units are suitable for the control of all of the listed clamping elements. Individual solutions are possible by using this unique modular system. Browse Hilma accessories for installation of hydraulic clamping elements, e.g. hoses, tubes, couplings, quick disconnects, pressure switches, valves and control elements. Die handling, e.g. roller bars, ball bars, ball inserts, carrying consoles and die carts. Hilma offers everything for a convenient and safe die change.